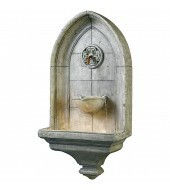 From a little bowl shaped table fountain to 20 foot tall home fountain we have stone water fountains of various shapes and sizes. 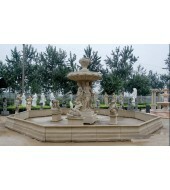 The carved Stone Creations can bring freshness to your furnished exterior or interior of the house. 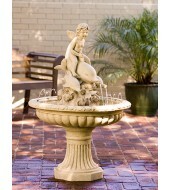 The fountain will surely complement your house’s internal part or backyard of your home. We have a wide range of products in all types of stones. You can choose from a wide assortment of stone wellsprings, marble fountains and rock fountains including huge layered wellsprings, bowl wellsprings, divider wellsprings, bubblingsprings, and showeringfountains. 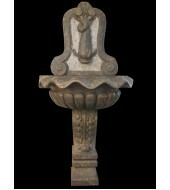 They are an extraordinary element for upgrading your office or home's passage, scene, garden or yard. Make your daily life special and even awe strike your friends or business clients who come to visit you. You would surely appreciate the alleviating sound and unwinding sight of streaming water. The sight would look all the more appealing with lights attached to it. Granite can work in any part of US no matter if you are living in a warm country side like Orlanda, Florida or in the coldest part of the nation like International Falls, Minnesota. The reason for that is that granite is a dense stone having less porous quality which makes it not to crack in times when water penetrates in the stone which will lead it to crack if it runs into ice. It is stain free as well unaffected by acids. If you live in a hot part similar to Islamorada, Florida lime stone or sandstone can also be a good option. These stones can be a part of your in-house home décor if you are living in a cold country as well since they are absorbent unlike granite it will look good if you install them in the house. With regards to fountains you will have to be sure about your is the cost that you are looking for and in which area of the house do you want it to be in. making bargains in materials for cost can be frustrating. So you need to make sure you are sure of what will fit your budget well. You can try common stones and if you have a good budget you can go for Granite and other characteristic stone. 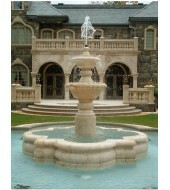 Having a smaller size fountain with a good stone can also be a good option. Particularly in cool climate where water is always solidifying and defrosting to avoid cement and water is the main component of fountains so stone water fountains will have a sturdiness that will last for a lifetime and will stick around to appreciate for eras to come. Dharajyot utilizes all kind of stones like marble, granite, cast stone, limestone or travertine. You can go to our website and check from the various products and check for the interior décor that you want or you can give us a call and we will also provide you with the ideas that will help the fountain that you choose to transform the outline of your home or office. 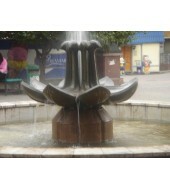 No matter whatever are the thoughts that you exhibit in front of us about your dream house or office we will help and motivate you to achieve it so you can be rest assured that whatever fantasy you have about your fountain you can share them with us and we will make sure that it is going to happen just as you want. Our master class staff be it in the customer service or the after sales department or the craftsman all work together as a team to make sure that all our resources and experience is properly utilized to provide excellent customer satisfaction. The new addition to the home furnishings namely the fountain will be made sure to be legitimately introducedat the location of the house as well as at any area across the nation. We can also help you with the right counsel about the functionality of your fountain namely the pipes and water line prerequisites that need to be picked up as well as the water pump. This is because our motive is to not provide you with a stone water fountains that has durable material but also make it a point that the wellspring’s mechanism is good enough. We help you to include extra water highlights like shower rings to genuinely feature the outline and uniqueness of your indoor water fountains. We additionally make wellspring pool encompasses that can offer your fountain in the exterior making sure that the water can stream through a stone fountain bowl and recycle well with with a pump. 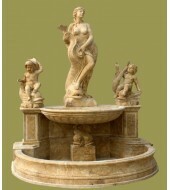 Our craftsman are not just regular stone workers but are artists who have been in the business since many years. They are specialist at hand-cut stones which they carve pretty well into natural beauty, human or creature form themes. We also provide a huge variety of various traditional themes as well as subjects which are out of the box that will surely interest you. 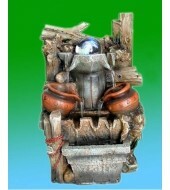 You are sure to make your wellspring a genuine focus piece of your home. Female figures, heavenly attendants, winged animals, angel, dolphins, lions, and stallions are created beautifully carved out of stone to remodel your home interior décor or backyard design plans. Regardless of what sort of look you are after we make sure that we provide you the best of your interest. Since we have more than 30 years’ experience in this field you can be sure that we would be able to provide you the fountain or any such material tailor made as per your specifications. However we also have a wide range of products to choose from which is exhaustive enough. In short we have the experience and the creative mind to make sure that we can hand craft a wellspring for you which suits your requirements and is in complete harmony with all the other rooms of the house. It does not matter if you set it up in the interior or if you think of setting it up in the garden it will improve the loveliness for sure.